A Bird Digimon discovered within an Antarctic base's computer, it is similar to a penguin. Because it lives in an ice-covered region, it has a fault of being weak in the heat, but as it has an affable personality, it will follow after you with a waddling walk. Also, its wings have degenerated, and although it is unable to fly and its walking speed is slow, it is able to move with a speed of more than 60 kph by sliding across the ice on its belly. Also, in the water it is even able to swim using its small wings. Its Special Move "Mugen Binta" is a technique in which it approaches the opponent without them noticing, then uses its hands to slap them in the cheeks with vehement force. n., From penguin 「ペンギン Pengin」, a flightless marine bird that inhabits the Southern Hemisphere. Mugen Binta  Eternal Slap 無限ビンタ N/A Super Slap Slaps away the the foe with wings. スライドアタック Suraido Atakku Sliding Attack Slides along the ground to collide with the enemy. Causes a trail of icicles to appear along the ground to slam the enemy. 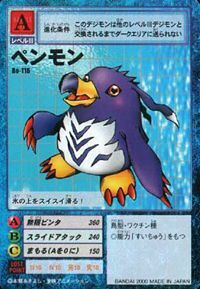 Penmon appears as an obtainable Child-level Vaccine type Digimon in Digimon World. This game marks the debut of Penmon in the franchise. Upon contact with the enemy, Penmon will freeze its right wing and slap the enemy with it. 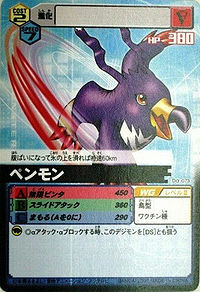 Can be evolved to Ikkakumon (0-2 DP) or Rukamon (3+ DP). 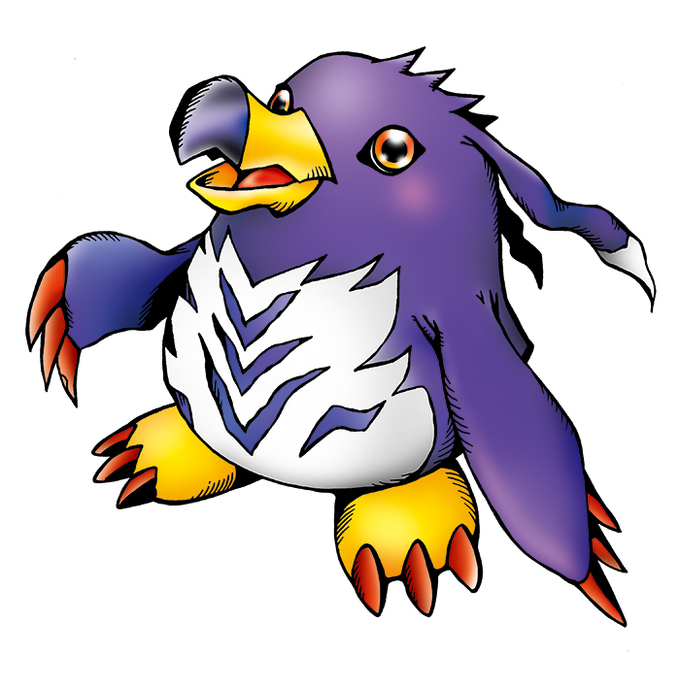 Penmon is a non-obtainable enemy Digimon which can be found at the Time Village. Can be found at Mangrove Forest. It can evolve into Cockatrimon if above level 27, Kiwimon if above level 26 and Defense above 95, or Diatrymon if above level 32. Can be evolved from Chicchimon if above level 10 and Water EXP 100. Can evolve to Kiwimon if above level 18, defense 80, and Bug Grass EXP 400, or Cockatrimon if above level 21, friendship 70% and Dark EXP 370. 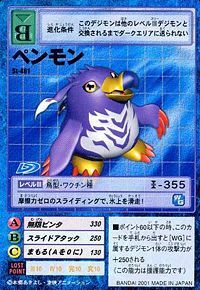 Penmon is available as a Digimon Card. 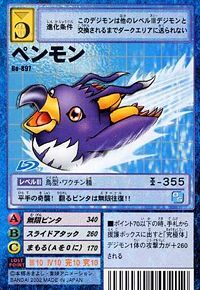 Penmon is available as a Digimon Medal. Evolves from Missimon. 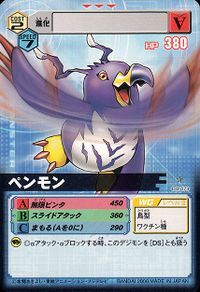 Can evolve to Dobermon, Meramon, Sangloupmon, or Thunderbirmon. Through frictionless sliding, it glides over the icy surface! It slides smoothly over the ice! A palmar surprise attack! Its fluttering slaps are eternal! !